In downtown Abu Dhabi, three Emirati women walk through a square, each casually balancing a large clay pot on their headscarf-covered head. Nearby, a row of men garbed in immaculate white gowns link arms and chant a hypnotic refrain to the beat of traditional small drums. I’m in the courtyard of Qasr Al Hosn, Abu Dhabi’s most historically important building, which was built in the 1790s as a fort and reopened last December as a cultural centre and museum. The fort was originally created to defend the only freshwater well that existed on Abu Dhabi Island. It later housed the emirate’s ruling families and – incredibly, considering the current city landscape – was entirely surrounded by desert until the 1940s. Today, the creamy coloured citadel appears diminutive and incongruous alongside the city’s looming skyscrapers of differing shapes and sizes, which glitter with reflections of the dazzling midday sun. Abu Dhabi is a city that has undergone dramatic change in a relatively short space of time. Less than 70 years ago, the UAE capital relied on its fishermen and a declining pearl industry for survival. The discovery of oil in the 1950s transformed the UAE’s society and economy, bringing unimaginable wealth to the area and an influx of high-spending tourists to Abu Dhabi and the neighbouring emirate of Dubai. Yet despite its relatively newfound wealth, today’s Abu Dhabi isn’t just about swanky hotels, sun-kissed beaches and supercars. This is a city that’s steeped in tradition, and whose residents are fiercely proud of their culture. Nowhere is this more evident than at Qasr Al Hosn, where alongside videos, art and artefacts, clients can watch live demonstrations from local artisans who are keen to pass on knowledge of their traditions and crafts. I watch bejewelled grannies with henna on their fingertips and wearing battula, masks that cover their mouth, practising talli, the Emirati art of embroidery. The women wrap the brilliantly bright threads around a pillow, deftly arranging numerous bobbins to braid the threads into complex patterns as they chatter. Further on, a stooped, grey-bearded fisherman beams with pride as he painstakingly demonstrates how he would dive deep into the gulf waters searching for oysters to shuck, wearing a turtle clip to keep his nostrils shut and a stone tied to his foot to keep him below the water. Times might have changed in Abu Dhabi but at Qasr Al Hosn, there’s a palpable respect and nostalgia for the past. My cultural journey of the emirate continues at Louvre Abu Dhabi, the museum designed by French architect Jean Nouvel that famously took 10 years to finish and cost £1 billion to build. 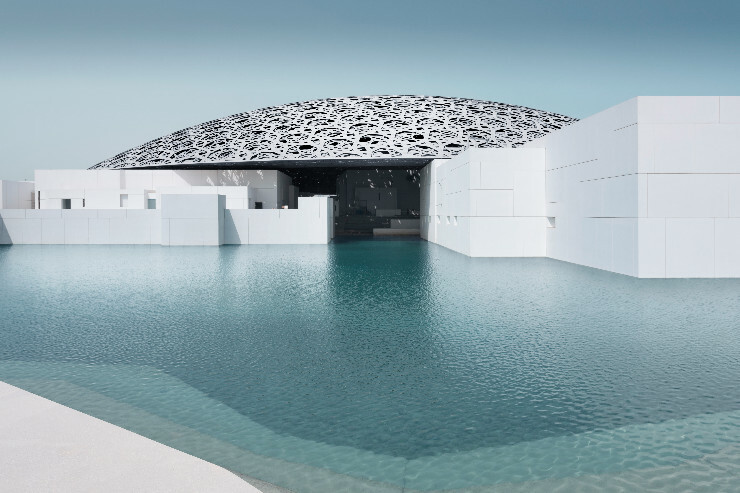 The Louvre is currently the main attraction on Saadiyat Island, which Abu Dhabi hopes will become a cultural hub – the isle will also welcome Guggenheim Abu Dhabi and the Sheikh Zayed National Museum over the next few years. The long wait for the Louvre was worth it. It’s a hugely ambitious museum, whose design is as impressive as the immense selection of artworks that lie within it. The exterior is a collection of white, rectangular buildings reminiscent of Arab houses, whose clean lines are juxtaposed by the rippling jade-green of the surrounding gulf waters. The steel-domed roof is a work of art in itself, its honeycombed design providing shade from the sun while allowing shafts of light to shine through, creating intricate patterns on the paved floor. Inside, the astounding collection of more than 600 artworks and artefacts from around the world tells a unique story spanning cultures and civilisations. The experience can be overwhelming at times, but the message is powerful, and one that is particularly pertinent today: no matter where we are born or what our religion, our humanity unites us. The message of inclusivity is echoed at the palatial Sheikh Zayed Grand Mosque, which is open to all faiths and cultures, and is visited by more than 40,000 people a year. Created in 1985 by then ruler Sheikh Zayed, the mosque took a decade to build. The architects were British, Italian and Emirati, while design influences came from Turkey, Morocco and Egypt. The result is a mosque of superlatives, comprising 82 white- marble, onion-shaped domes reflected in striking symmetry in the pools that stretch across the courtyard. Each step reveals more visual drama, from the painted flowers that curve around the marble pillars to the gilded chandeliers dripping in Murano glass and Swarovski crystal. The world’s largest carpet can also be found here, meticulously handmade over the course of 20 months by more than a thousand weavers and made up of 2.2 billion hand-tied knots. To avoid crowds, recommend clients visit at opening time (9am) or, if they’re into photography, at sunset, when the light shows off the architecture in all its finery. A journey into Rub Al Khali, or ‘the Empty Quarter’, reveals Abu Dhabi as it once was, stripped back of glitz and glamour. This is the world’s largest uninterrupted sand mass, and I’m enthralled as we drive through the beautiful nothingness in our 4x4. The soft sand’s curves and rippled peaks, shaped by the wind, remind me of russet-coloured buttercream on a cake. I spend the next hour or so whooping as we dune bash then, when it’s over and my heartbeat has returned to normal, I’m transfixed by the desert’s serene beauty as the sun hangs low and golden hour sets in. We stop at Arabian Nights Village (arabiannightsvillage.com), where I ride a camel, try my hand at sand-boarding, and watch an evening show of belly-dancing and singing over a delicious meze meal. On the drive back into the city, I ask our driver to stop briefly in the middle of the desert so I can gaze at the sky. It glints with more stars than I’ve ever seen, including the creamy spread of the Milky Way. 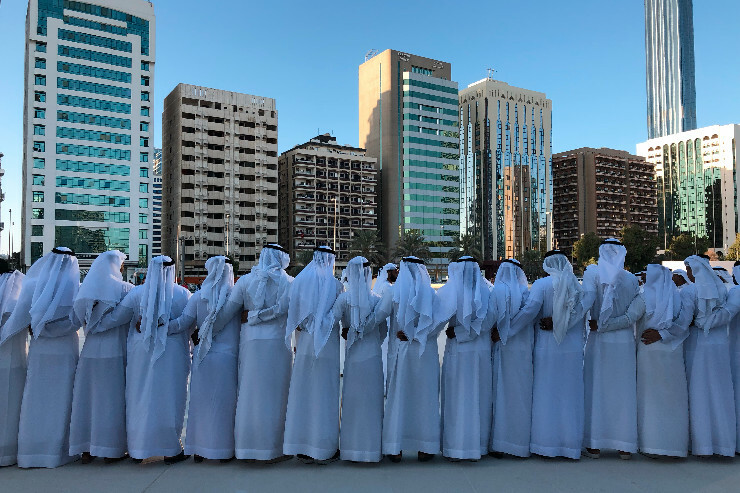 Here, away from the showy skyscrapers, is an Abu Dhabi that feels wonderfully and inextricably connected to its past. Opening this month, this luxurious, Arabian-style hotel is set in the tranquillity of the desert, 30 miles from the city. Made up of 90 rooms and 13 villas, it also features a pool and rooftop bar, plus a Talise Spa featuring hammams and cryotherapy. There’s also an onsite desert camp offering numerous activities. Prices start from £290pn B&B. At this new eco-conscious beachfront hotel, guests are given a reusable water bottle on arrival. Dining options include a traditional restaurant and healthy breakfast buffet. Clients have three pools to choose from and a pristine beach that’s home to turtles and dugongs. Prices start from £275pn B&B, based on two sharing. Located on the western side of the Corniche, this classic hotel offers the best views of the emirate from its Observation at 300 lunch spot. Clients have 12 restaurants and bars to choose from and can now explore the Corniche from the water on the hotel’s yacht. Prices start from £247pn room only.